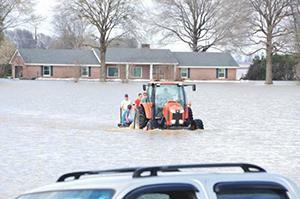 Photo right: Flooding in Washington County, Mississippi. Photo Courtesy Community Foundation of Washington County. One of the groups working to help homeowners rebuild and reinforce following last spring's flooding is Delta Force of Washington County. This group made up of local clergy, contractors, social service collaborators, and other community members meet to identify Washington County citizens who have suffered home damage due to flooding. They also provide counseling and outreach services to individuals requesting those services. Delta Force is currently seeking volunteers and volunteer organizations to help us complete work on the homes approved for service. Projects are extremely flexible; afternoon work or long term projects are both welcome under the supervision of our construction committee. Tools and supplies can be provided but groups can bring any relevant tools they are comfortable with handling. If you or your organization have an interest in setting up a volunteer project with Delta Force, please email Caleb Herod, Volunteer Coordinator at cmherod@gmail.com. This message was relayed by the Mississippi United Methodist committee on Relief (UMCOR).